Click to viewNext month sees the release of Valkyrie, a film about Claus von Stauffenberg, the man who tried to assassinate Adolph Hitler. Plenty of time travelers have had the same idea, although their plan was to kill Hitler before he enacted mass genocide. Their intentions may be noble, but the plans always seem to go awry, leaving history unchanged or even worse than when they left. We list all the ways their attempts go wrong, so you can plan your time travel accordingly.His Life is a Fixed Event in Time "No Time Like the Past" (The Twilight Zone): Paul Driscoll is a well-meaning but ineffectual time traveler. Not only does he fail to kill Hitler (thanks to the intervention of a suspicious maid), he also fails to warn the Hiroshima police about the atomic bomb and fails to keep the Lusitania from being torpedoed. It turns out that he is unable to change past events, and, when he does effect events in the past, it is only as part of a predestination paradox. He's More Clever Than You'd Think I Killed Adolph Hitler by Jason: When a depressed hitman is contracted to go back in time and kill Hitler, the Fuhrer gets the better of him, stealing his time machine and leaving the hitman in the past to wait and plan his revenge. "The Savage Time" (Justice League of America): The supervillain Vandal Savage travels back in time and places Hitler in cryogenic storage not to prevent the horrors of the Holocaust, but to assume control over the Nazi party and continue its regime into the present day. To reset the timeline, the Justice League travels back in time to remove Savage from power and have Hitler reinstated. Midnighter: In the first arc of the Midnighter solo series, a man named Paulus claims to have replaced Midnighter's secondary heard with a bomb, which he will detonate unless Midnighter goes back in time and kills Hitler. 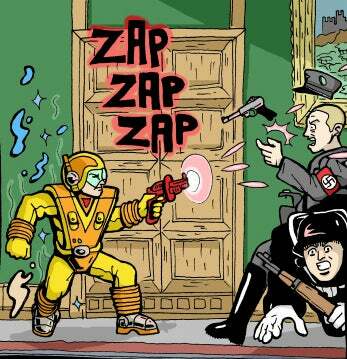 Midnighter does try to kill Hitler as a young German soldier, but he is stopped by time police from the 95th Century. "The Man Who Dreamed the World" (The Fantastic Four): When She Hulk, the Invisible Woman, the Human Torch, and Nick Fury mysteriously find themselves in the year 1936, Fury decides he may as well kill Hitler and slips off to Germany. Although the other three attempt to stop him, but just as the Invisible Woman seems to have talked him out of it, Fury shoots Hitler, killing him. But, it turns out that they had been in the dream of a coma victim, who snapped back to reality when Fury altered his dream timeline by killing Hitler. The actual timeline remains intact, leaving Fury in a less than happy mood.